much less arrive at its newest destination, Seattle, Washington. Weathering 25 years and a couple of recessions, Rocky Mountaineer Vacations has adopted a winning policy of gradual but steady expansion. 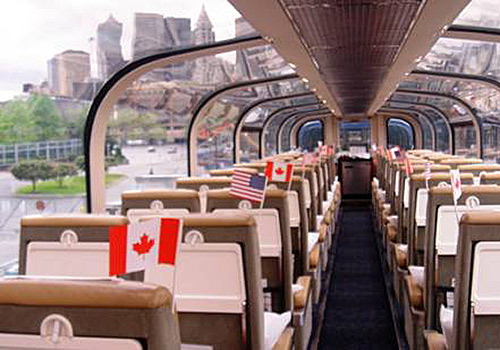 Based in Vancouver, BC, this tourist rail company has succeeded where many competitors have tried and failed. Montana Rockies Daylight, Royal Canadian Pacific, BC Rail's Whistler train and the American Orient Express/GrandLuxe are just some of the non-survivors. 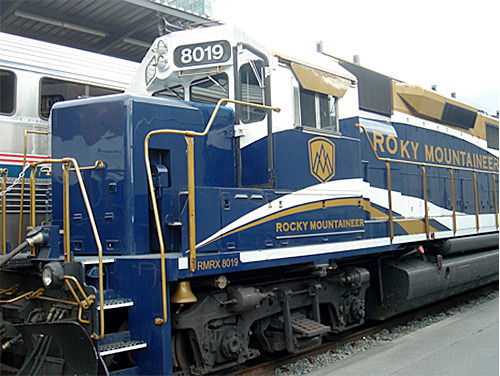 But Rocky Mountaineer Vacations (RMV) keeps beating the odds. "Rocky Mountaineer is responsive to customer preferences and suggestions," a company spokesman explains. "We are driven by customer satisfaction and not just the bottom line. And we honor the scenery by always traveling during daylight hours. 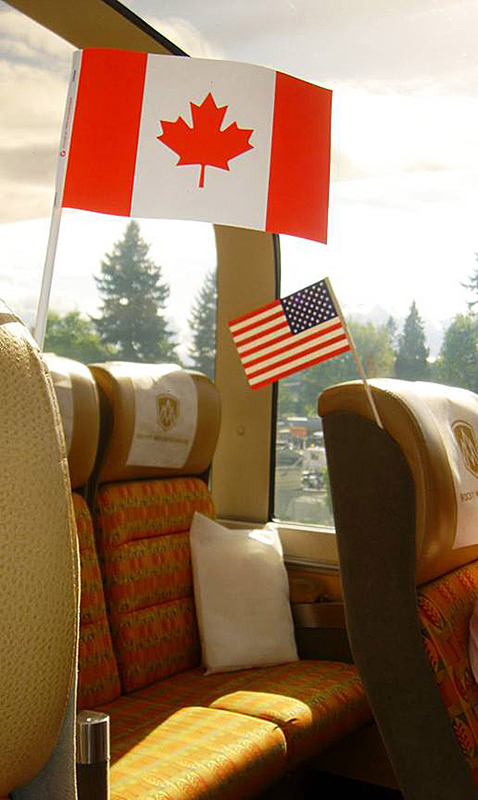 "Today, a Rocky Mountaineer train introduced our first excursion outside of Canada's borders. This new destination has been in the works for about five years, and involved considerable red tape with various branches of the United States Government. "The trains are seasonal, and run only from April through September." Ted and I have our tickets in hand for today's 3:30 PM return trip to Vancouver, BC. 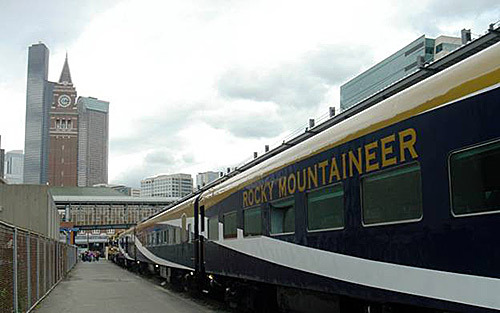 Twenty-five years ago, Rocky Mountaineer Vacations acquired a train set of single-level Daynighter coaches, along with permission to run a train from Calgary to Vancouver. RMV doesn't offer point-to-point transportation, but designs experiences via independent packages that can be modified to suit the individual. There is no tour leader or group of people traveling together. But everything is confirmed and pre-paid, including hotels, transfers, sightseeing, car rentals, and VIA Rail segments if desired. Even Alaska cruises can be included. This is RMV's first regularly scheduled trip into the US. This year, there are several departures scheduled to this, their fourth, destination. Some of the cruise ships debark in Seattle, so the timing is right for bringing passengers up to Vancouver by the afternoon train. From there, they can take a train eastward the following day. 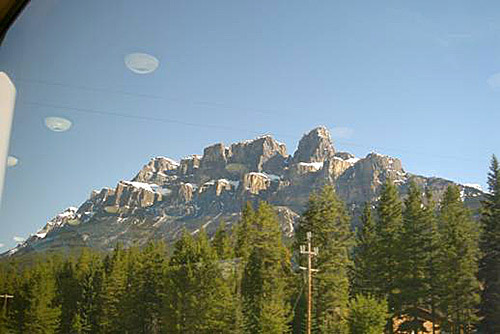 From Vancouver, one of RMV's trains runs its original route through the Canadian Rockies to Banff and Calgary (with an overnight hotel stop in Kamloops). The second route travels to Jasper via Kamloops. RMV's third route goes over the former British Columbia Railway tracks, from North Vancouver, with stops at Whistler and Quesnel before arriving in Jasper. 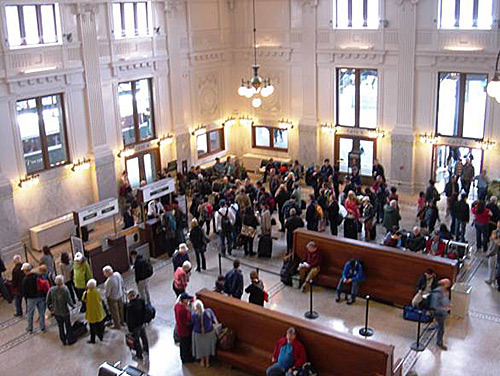 Today, May 10th, it's all about trains at Seattle’s beautifully restored King Street Station. 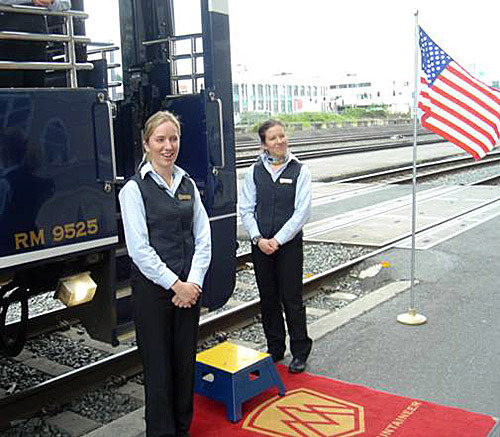 National Train Day, an annual Amtrak event, is celebrated at train stations all over the US. There are speeches, displays, and kiosks manned by various entities. RMV, who has set up its own kiosk with brochures and posters, and seating for their own passengers, picked the perfect day to make their dramatic entrance. We check our luggage and hand our Rocky Mountaineer tickets to Rocky's station manager, who is full of enthusiastic greetings. "Rocky Mountaineer hopes to eventually expand into Oregon, and later down into California," she tells us. This illustrates the company's business model: get one new project up and running, make it profitable, then take baby steps towards the next one. The Rocky Mountaineer train is parked at the south side of the station on a siding sometimes used for private rail cars. It is a very long walk past the two engines, the generator car, some coaches, and finally to our GoldLeaf Dome car at the end of the consist. Ted makes photo stops along the way to capture the energetic paint scheme: a roof of gold atop sweeping bands of royal blue and white. "This train looks as if it's moving even though it's standing still! ", he remarks. Rocky Mountaineer's traditional red carpet graces the entrance to the double-level GoldLeaf Dome carriage; it's up a spiral staircase to assigned seats in the middle of the car. The comfortable high-backed reclining seats in this first-class car are upholstered in warm tones of yellow and gold. Carpets, and everything inside, look fresh and spanking new. The train backs south, then switches over to the northbound main line. This provides an excellent view of King Street Station’s red brick clock tower through the glass-topped dome. After a non-alcoholic toast, the first meal sitting is called downstairs to the dining room. These GoldLeaf Domes were not part of the original consist. But nearly every passenger on the railroad's first trip in 1989 told owner Peter Armstrong that the train needed domes to do justice to the amazing scenery. 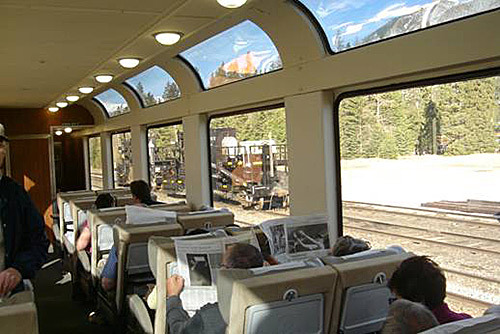 While the Daynighter coaches (now called RedLeaf Class) have large windows, they aren't quite large enough to see the tops of the Rockies. Soon afterwards, the company had their first dome designed and constructed. Wanting to make sure it would be a success in spite of the high price for passengers to upgrade, RMV trademarked them as GoldLeaf Domes. They gradually added more to their fleet, which still includes some original Daynighter coaches. More recently, a SilverLeaf single level dome was created from a reconstructed Daynighter, with much higher side windows, and extra windows curving into the roof, providing excellent views. After it became a hit, more were added. Northbound tracks pass the Marriot Waterfront Hotel, the venerable Edgewater Hotel, and Victoria Clipper's twin-hulled ferries. Along the waterfront are hundreds of sailboats resting in slips, many seafood restaurants, and a lighthouse. On the inland side of the train are expensive homes (possibly owned by the Microsoft millionaires) with extravagantly landscaped back yards. There are some industrial activities here, but just turn your head westward and you'll see the water, green meadows, and forests. On clear days, the majestic Olympic Mountains, covered with snow and ice, hover over the western scene. This scenic view cannot be seen from the highway. The Rocky Mountaineer is frequently put into sidings to let freight trains pass, and under slow orders much of the time. Some stops appear unnecessary. The company has wisely padded the schedule, anticipating unfortunate dispatching from host railroad BNSF for their "foreign" train. RMV makes their schedule two hours longer than the Amtrak Cascades, which operate over the same route in 3 and a half hours. The onboard staff takes pains to explain the reasons for the stops and delays, probably for the benefit of passengers from Europe or Asia who are accustomed to fast trains without dodgy stops. "This is very normal, and doesn't mean there is anything wrong with the train. Other trains use these tracks too and we sort of take turns," Brandy reassures. "So please don't worry. It will happen both here and in Canada. There is a lot of freight traffic here." 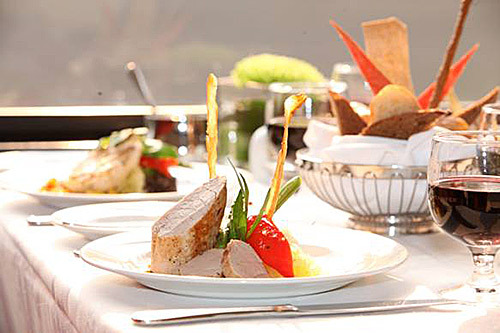 Late lunch downstairs in the luxurious dining car features soup or salad, then a beef or halibut or vegetarian main dish. An attendant comes by several times offering the four choices of wine. Dessert for two—apple strudel, ice cream, and fresh berries—is grandly served on one large oblong dish. Buoyed up by the generous wine servings, a group in the other end of the dining car starts singing a hearty rendition of the national anthem, Oh Canada. 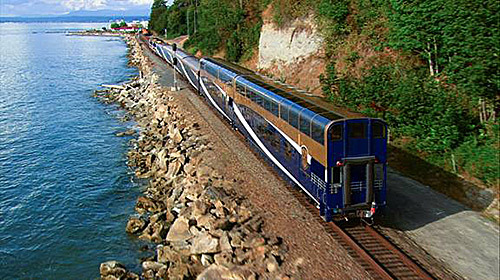 The tracks cross several river bridges, past the Peace Arch at the Canadian border, and through the quaint seaside resort of White Rock, where bald eagles fly over the beach. 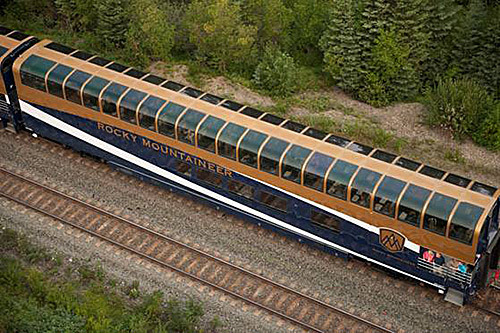 We have ridden on Rocky Mountaineer's trains several times over the years. RMV continue to adhere to high standards. Sparkling clean, well-maintained equipment, attractively blue and white uniformed and enthusiastic staff, and low-key information about the route continue to provide a memorable experience, such as: "We saw whales out there on the way down, so keep your eyes open!" RMV is now promoting trips with "Three Days on the Train" which they say passengers want. Sounds just like the kind of trip a rail enthusiast would love. After all, the more time aboard a train, the better we like it. 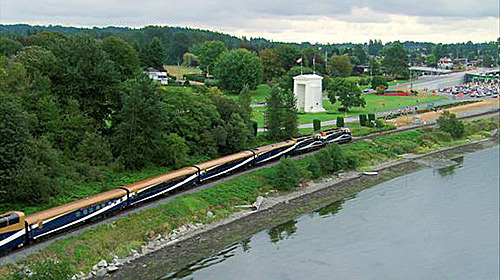 Rocky Mountaineer reservations can be confirmed at rockymountaineer.com or by calling 1 877 460 3200. However, if you can locate a travel agent who has been on the various routes, experienced the different types of equipment, and stayed at the hotels RMV uses, such as the Fairmont Hotel Vancouver, you may enjoy a better-planned vacation. Travel agents are notified about any extra-value plans (get a free night in Vancouver if you book a certain package, by a certain date, for example). And a travel agent can add air or Amtrak connections for you.